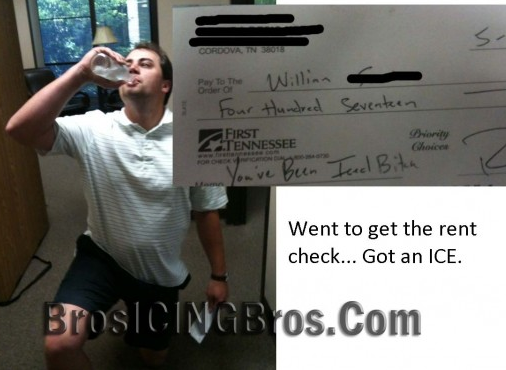 Since we last checked in, Bros Icing Bros has become even more of a THING. This bro himself was Iced five times in a 36-hour span over the weekend. A Bro friend at Stanford Business School sends word of what was potentially the first-ever group Icing on Monday — at the hands of a restaurant waiter, who brought an ice-cold sixer out with the entrees. One of the victims was the CE-Bro of a pro sports team. Another Bro acquaintance had to schlep to three different Lower East Side bodegas on Sunday to find one that even had Smirnoff Ice in stock. I will make an educated guess and say that that was the first time that any of those bodegas had ever sold out of the drink. So cynical! Luckily, this Bro was at a house party over the weekend (yes, he was Iced), where he randomly Bro’d out with a marketing rep for Diageo, the parent company of Guinness, Baileys, Tanqueray-and, yes, Smirnoff. Said Bro was kind enough to put me in touch with a Senior Director of Corporate Communications at the company, who agreed to talk about the meme of the moment-though wanted to only be identified as a “spokesperson.” Here’s what she had to say. SO WHEN DID YOU GUYS BECOME AWARE THAT THIS WAS HAPPENING? It got on our radar over the last few weeks, as it became an online thing. People started sending pictures and stories to employees at the company. There are a lot of interesting things that consumers do with our brands. This was just one of those things. If you look around, there are lots of examples of this sort of stuff happening with the online community. Things like this happen. TELL ME THIS ISN’T SOME MARKETING SCHEME HATCHED INSIDE YOUR OFFICE TO GET PEOPLE TO DRINK YOUR PRODUCT! Icing is consumer generated. Some people think it’s fun. We never want underage Icing, and we always want responsible drinking. HAVE YOU NOTICED AN IMPACT IN SALES FROM THIS? That would require an awful lot of icing [laughs]. Smirnoff is a large brand, and so is Smirnoff Ice. It would have to be much bigger for us to notice anything in terms of sales. WHO IS THE QUINTESSENTIAL SMIRNOFF ICE DRINKER? IS IT A BRO? We have a very diverse and loyal consumer base. People might be surprised to know that it’s about 50–50 male-female. Most of our consumers are between 21–39. It’s a national brand and a national product. SO YOU GUYS DON’T TARGET BROS? I’VE ACTUALLY HEARD THAT IT’S MARKETED TOWARDS YOUNG “URBAN” COMMUNITIES. I would characterize our base as diverse. We have a 28 percent market share of the malt beverage business. It’s a popular beverage. WHAT’S THE COMPANY’S TAKE ON ICING? I’m sure everyone has a different view. I wouldn’t say Diageo has a view on Icing. It’s just something consumers are doing. A LARGE PART OF THE HUMOR SEEMS TO BE DEPENDENT ON THE FACT THAT PEOPLE FIND SMIRNOFF ICE, UH, UNPALATABLE. HOW DO YOU FEEL ABOUT THAT? Smirnoff Ice is one of the best-known brands in the world. Fans will continue to enjoy it, regardless of the Icing phenomenon. OKAY. THANKS FOR YOUR TIME. YOU SWEAR YOU’RE NOT BEHIND THIS? Yes. We were as surprised as everyone else. HAVE YOU EVER BEEN ICED?